Imagine laundry done, kids on time to activities, dinner on the table, and a clean house. Now imagine all of that without feeling stressed every second of the day and night. Imagine a good nights sleep because you know you've done what you needed to do. You also know what's coming up next for you and your family. This 13-week email class will help you go from frazzled and stressed to feeling empowered and free as a mom. You will have systems in place to help you keep up with your family, home and life. Creating freedom and peace in your life. I love being a mom and I wouldn't trade my kids for anything, but the truth for me, and many other moms, is that when I became a mom, I went from being a capable woman who could keep up with life to a person who felt tired, stressed and overwhelmed much of the day and night. to help you get organized and get your crap together and even have a little time to do something you enjoy? What if I told you it takes less time than a Real Housewives episode each week? Sounds like a dream doesn't it? It isn't a dream. 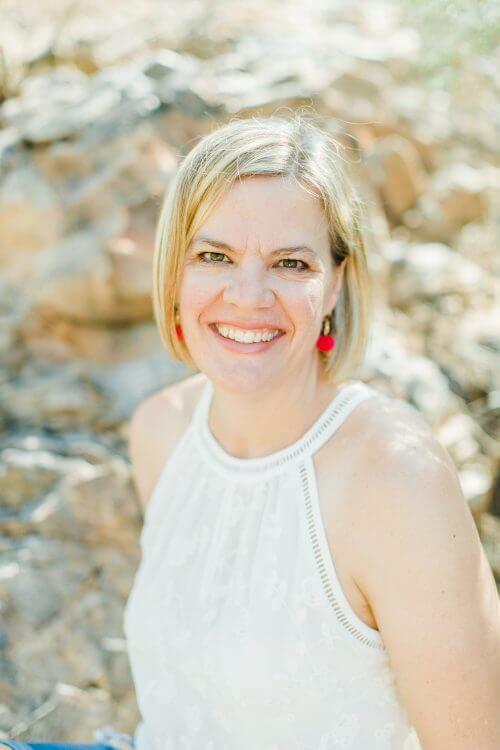 It's possible for you and over 4,018 women have done just that with the Real Organized Moms Email Class. I've been exactly where you are today. I used to be an organized and efficient person. Tackling mountain-sized to-do lists in a day and having free time to boot. Then I had kids, and it threw me for a loop. I got to the point that taking a shower was a successful day. As the kids grew up a bit, it got a little better, but I still felt like I was living in a fog and I was stressed all the time. One Saturday, we were sitting having breakfast in our PJs. It was a little after 10 am. I got a phone call from our Girl Scout leader. She asked when we would be arriving for the event that started at 10 am. I had missed it! Not only that, I'd completely forgotten about it. It was so embarrassing. The chaos of getting out the door to make it to the event was no fun either. At that moment, I knew I had to find a better way, and a way to no longer live in that fog and stress. Since that day, I've worked to use my organization skills to put systems in place in my home that allow me to keep up with the ever-changing schedules and activities of kids, as well as run a business and take care of the house and even find a little time to do things I enjoy. It's not to say that there aren't times that I'm stressed or that I always have time to chill or craft, but overall, I'm SO much less stressed. Which helps everything in my life. 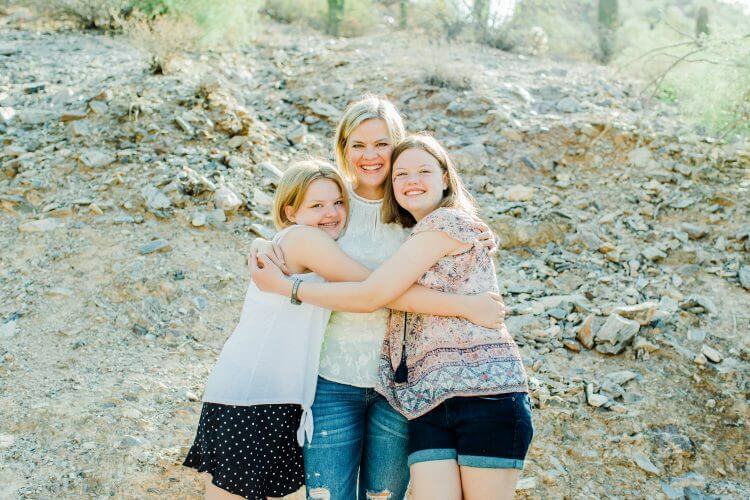 My kids enjoy having a mom who's not stressed out every second of the day. I've taken my systems and put them in the Real Organized Moms Series. Now you can benefit and have the same increase of peace in your daily life as well. I hope you'll take advantage of my systems and organized mom secrets and use them in your life. I know they'll make a difference for you, too. 13 weeks of emails teaching you a system each week to get your life organized, help you get your crap together, and feel confident as a mom. 13 weeks learning systems that create freedom in your home. They will make a difference in the organization of your home and family. 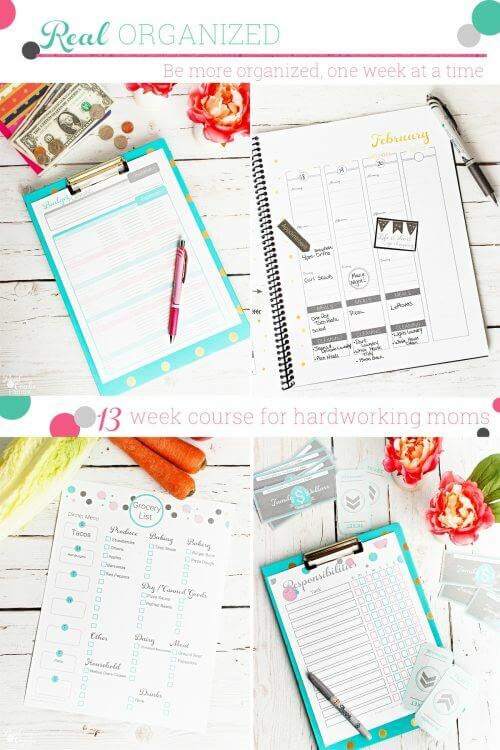 You will learn systems for keeping up with your calendar, cleaning, recipes, meal planning, grocery shopping, pantry, kids responsibilities, budget, paying bills, back to school and kid's clothes shopping, as well as organizing a mom office space or your home office. Most systems take less time than an episode of Fixer Upper to finish (about 30 minutes and 1 hour). There are a few projects that take longer, but I'll show you how to break those into smaller bits of time so you can get them done during the week. "The house is a lot more organised and kids can get out the door without too much stress." "My house was a disaster and this made it less stressful, and clean." "I really loved it all! We all need to make time to get our life into order!" Printable Checklist each week to help you track and know what steps to take to finish the task for the week. You feel stressed and overwhelmed as a mom. Keeping up with the house, kids activities and your own life gives you hives. You're tired of feeling stressed and overwhelmed all the time, and you're willing to give up the time it takes to watch a Real Housewives episode each week to learn systems that will help you as a mom. You want to find a way to keep up, not live in a fog and dare we dream...even have a little bit of time for something fun you enjoy. At least one of your kids is pre-school or school-aged. This system works best for moms of school-aged kids. You're a hoarder and need major purging and intense organizational skills. You're not willing to give up that one TV show in favor of your sanity and learning organization systems for your home and life. You've already got motherhood figured out and always know what's going on with your family and yourself. You always get the house clean, laundry done and meals on the table on time. You are a mom of an infant or toddler. Do I have to buy the printable bundle to complete the class? Nope. They're not required. I can tell you that the printables will make it a lot easier and faster for you to put in place the systems in the class, but they're not required. If I have an infant or toddler why won't this work for me? It's not that it won't work for you, but the infant/toddler stage is its own animal and often feels like getting a shower for the day qualifies you for an award. The infant/toddler stage is a time to learn to go with the flow of the needs of your young children and, IMO, isn't a good time to try to add more. "Now I'm actually making a list of things when they get low and what I need for the weeks meals instead of running out of this and buying double of that." "Easy, helpful, exactly what I needed."